Bitter lemons, wonderfully and unexpectedly, thrive in the mid-Atlantic. Their fruit is small, pithy, and seedy, but they ferment well! This vinegar really emphasizes the bitterness of the lemon’s rind and pith, with floral citrus in the background; the effect is not unlike an amaro, a digestif. 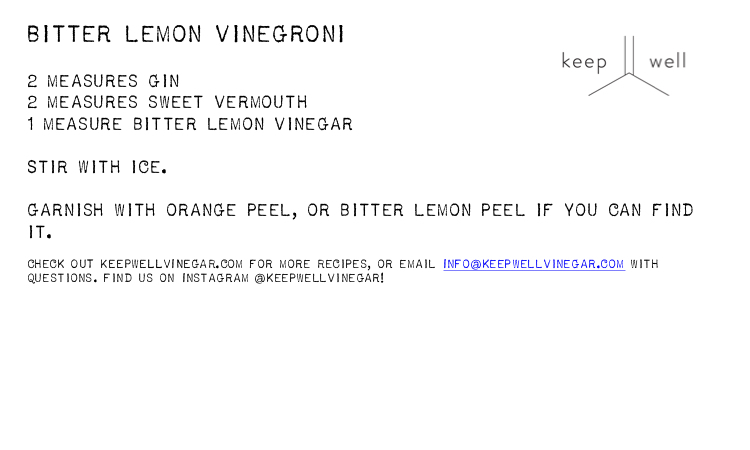 Bitter lemon vinegar is wonderful in cooking, anywhere you might use lemon juice. It also shines in cocktails, like our Bitter Lemon Vinegroni!